Are good running shoes cheap running shoes? Buying good running shoes is the first step for beginners and veteran runners alike. It's probably the single most important thing you can do before starting any beginners running exercise program. -And it really doesn't matter if they're for running a marathon or just your daily treadmill running at home or at the gym. The footwear you choose to wear can really make or break your whole running fitness program. If you really want to get the full running health benefits, it's important that your feet are comfortable and are in optimal running position. Many don't even consider this and pay the price later with sore feet, blisters, or at the very least premature wear on expensive running shoes. Having the correct running sneakers or athletic shoes for your foot type and planned activity is even more important if you're a beginner runner just starting out, or if you're running hoping to lose weight. ....and ultimately quitting before you even get started. Good running shoes will provide comfort and cushioning for your feet, helping to position them for optimal placement and helping to reduce and even prevent many injuries. In a nutshell, the right pair of shoes are worth their weight in gold. -How to choose running shoes can be a daunting task. There are just so many models to choose from, not to mention the endless brands. Advice on good running shoes, and which are the best can be confusing. Good running shoes don't have to cost an arm and a leg and there are many very good entry-level models that can be purchased starting from around $50, less if you shop around and look for specials and sales. -While you need not spend a fortune, stay away from the real cheap running shoes, your feet and legs will pay for the difference in price. Most of us fall into the street running category; of the various types of running shoes available, these are indeed the most common sold by far. -Foot Types: low arch (flat foot), high arch and normal arch. 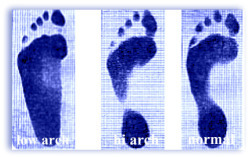 Although not a precise test, some folks use the wet footprint test to determine your foot type. This test involves wetting the bottom of your foot and standing on paper bag to make a footprint. Some shoe stores have similar tests using special paper, minus the water, to take the imprint. -If the footprint is basically the same size as the foot is, (far right above) it is said to represent a low arch or flat feet, and is thus an overpronated foot type. -People with footprints with a very narrow outside curved shape are said to represent high arches or an underpronated foot type. -Footprints with a somewhat wider and less curved shape are said to represent a medium arch or neutral pronation. 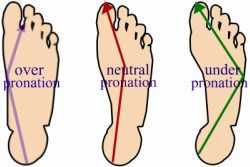 -Because too much weight is put on the toe side of the foot during overpronation your weight isn't distributed evenly, and the body doesn't absorb the shock as efficiently. This can lead to foot and leg injuries. People who overpronate, tend to wear down their running shoes on the inside of the shoe, toward the big toe. -When choosing a walking or running shoe, a person who overpronates should choose shoes with good inside support, usually with strong material at the inside sole and arch of the shoe. Gel types are great for over-pronators and are quite popular. -Shoes that feature motion control and stability in their names would be a good choice for runners with this type of foot. Stiffer shoes also help support overpronation because they prevent the foot from rolling inwards as it progresses from heel to toe during the running motion. A normal arch, or neutral pronation is the ideal and the most efficient type of pace when using a heel strike gait that most of us use, as the entire body helps to absorb the shock generated during running. -A good fit and normal cushioning should be all that's needed. But, if you do a lot of running exercise, it's a good idea to have at least 2 pair of good running shoes, to allow for drying time and a longer shoe life to boot. If you have a high arch, chances are pretty good you run on the outside of your foot, called under-pronating. Those of us who are even slightly bow-legged also tend to underpronate, as the foot rolls outwards as we run. A person who underpronates tends to wear down their running shoes on the outer edge and towards the rear of the shoe. -They'll need to look for a flexible sneaker with a soft mid-sole to act as a shock absorber for the body. -Look for the words flexible or extra-cushioned in the sneakers name when shopping for a high-arched foot. The illustration shows the path from heel to toe of the 3 foot types. Once you've decided what kind of running you'll be doing, and what type of foot you're shopping for, there's just a few more buying tips to consider. 2. -The heel bed is very important, it should be a good fit, nice and snug with no rubbing and slipping around, this is where the blisters often come from. 3. -There should be plenty of room in the front of the shoe for the toes to move, and you should have a full thumbnail between your biggest toe (not always the big toe) and the tip of the shoe. 4. -The width and height of the shoe should fit snug, but comfortable without any unnecessary movement of the foot from side to side or slipping. 5. -Don't make the mistake of buying what you think are the best looking shoes. You want good running shoes, sure you want to look good and be in style, but the overall fit has to be much more important to you. 7. -Try on various brands and models. Don't always assume certain brands or styles will always be good running shoes for you, methods of construction change and are sometimes modified. -Different manufacturers always have at least slight differences, not always noticeable on visual inspection. Some styles run bigger or smaller, wider etc. 8. -Make sure to try them on at the end of the day when your feet are tired and likely to be puffier, and also be sure to wear socks that are similar to those you'll be running in. 9. -Lace them up and take a good hike (or jog) around the store, paying special attention to any rubbing or slipping. ....you probably bought the wrong running shoes! -And, if you have had foot problems in the past, it's a good idea to seek out the help of those who know feet best. Whether it’s a professional at your local running or shoe store, or even a podiatrist in some cases. Can Cheap Shoes Be Good Running Shoes? Buying cheap running shoes can be awfully tempting when you look at the current prices of good athletic shoes. Keep in mind though, not only are cheap running shoes much more likely to cause irritation or even injury for the serious runner, but they will wear-out a lot sooner. If price is a serious consideration, some dealers actually sell used running gear, as well as online at ebay. Also, many shoes are returned because of improper fit or type, and can oftentimes be purchased at a real bargain. There are a number of shoe manufacturers including: Asics, Adidas Nike, New Balance, Saucony, Brooks and many more. Most of these manufacturers create several very good entry-level running sneakers. -Most good running shoe stores will let you return shoes if they've only been worn a little bit on a treadmill, (ask to be sure) so consider breaking them in with a bit of indoor running before you hit the streets. If you're buying online, be sure of the dealers return policy before you buy, or you may be stuck with a pair of not so good running shoes. -Finally, if you're really a dedicated runner, read the running shoe reviews. Asics Gel receives good reviews every year from the major running magazines as does Adidas and Brooks. Make sure to try a few of the well-reviewed shoes on, assuming they're designed for your foot type and the price range is acceptable. -If you're a beginner runner and not sure yet if running is your sport of choice, it still makes a lot of sense to get good running shoes. read this article by a certified athletic trainer and his views on choosing athletic shoes. -If your feet feel good, you'll choose the right sport -and your legs, knees, muscles and, oh yeah ....your feet will thank you too! Running To Fight Depression - Running Barefoot - Why Running?